(Nanowerk News) Researchers at UCL and the University of Liverpool have shown a new way to use a single molecule as a magnetic field sensor. In the study, published today in Nature Nanotechnology ("Tunable magnetoresistance in an asymmetrically coupled single-molecule junction"), the scientists show how magnetism can manipulate the way electricity flows through a single molecule, a key step that could enable the development of magnetic field sensors for hard drives that are a tiny fraction of their present size. Magnetoresistive effects, in which the electrical conductivity of a substance is manipulated by a magnetic field, have many applications today, including the magnetic field sensors in computer hard drives and unconventional types of computer memory. In hard drives, magnetised areas on spinning disks are used to store information. As the magnetised areas pass a magnetic sensor, they trigger fluctuations in electric current flowing through the sensor, allowing the data to be read. Making these areas smaller increases a hard drive’s storage capacity without making it bigger, but also requires a smaller sensor. To get around this problem, the researchers, based at the London Centre for Nanotechnology, developed a method of magnifying the effect of the magnetism on the flow of current in the detector. 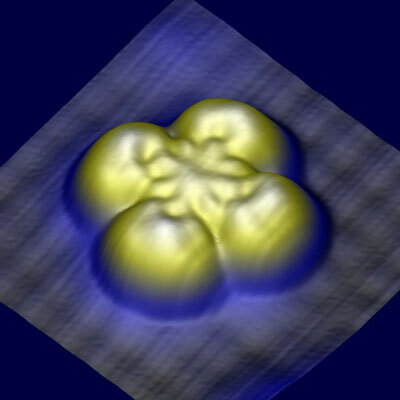 First, the researchers created a junction in which a single magnetic molecule was weakly coupled to two metallic leads. The barriers between the molecule and the nearby metals were high enough that electrical charge in the metals could not flow over the barriers. However a small fraction of the charge can effectively go through the barriers by undergoing quantum mechanical tunnelling. This well-studied process, which is analogous to a person repeatedly walking into a closed door and occasionally magically appearing on the other side, enables a very small current to flow through the molecule when a voltage is applied across it. To control the molecule’s energy levels, the scientists configured the experiment so that the molecule was much more strongly connected to one metal lead than the other. “This creates a large lever arm in which small shifts in the molecule’s orbitals caused by the magnetic field are magnified” says Cyrus Hirjibehedin, the project’s lead scientist. The team’s research demonstrates a new kind of sensor for magnetic fields that can be created in systems as small as a single molecule. The technology is promising for creating new computer technologies, and further refinement is being explored for commercial applications.